Despite being founded in 2016, Thurso Surf have quickly developed a reputation as a company who develop quality products and you can see why with boards such as this. It ranks highly in all the vital areas and ensures that you have a great experience when you are out there on the water. As a board this works perfectly as an all-rounder as it will provide a great level of performance for any skill level and also any level of age or fitness too. It is very easy to use but doesn’t sacrifice much in the way of performance which makes it a board that will be enjoyable, even for those seasoned experts. 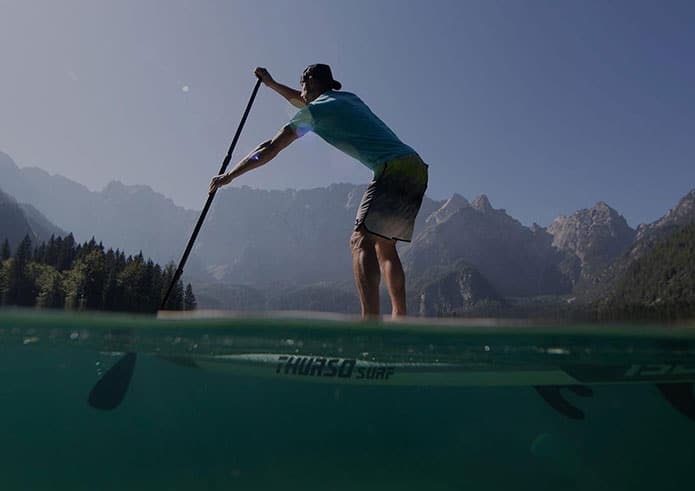 It’s an inflatable SUP that looks great when you’re out there on the water, which is always great as you want to be able to show off your board. While looks aren’t the most important aspect, this product from Thurso Surf is able to excel in all the key features which make the stylish design an extra positive. They are able to offer all of that while still offering a good warranty on their board to give you peace of mind should anything go wrong. While it’s unlikely, if it does go wrong, then Thurso Surf are a company who are also getting a great reputation as a company in offering a high level of customer service, giving you reassurance that any problem will be solved quickly. 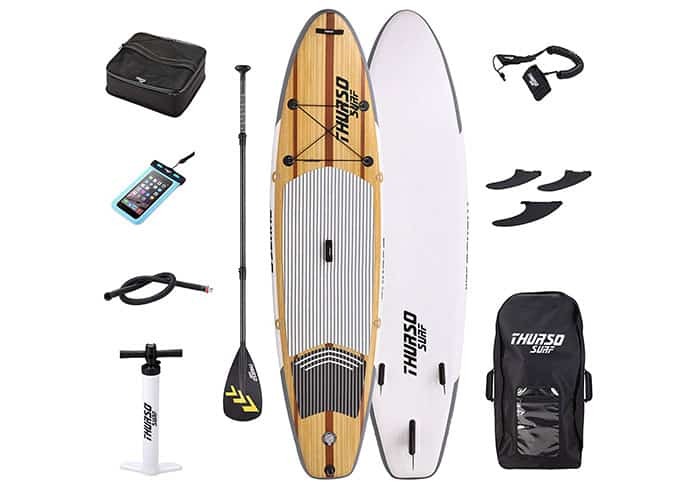 Here we will go through the features which make this such a great board and how it will help you have a great time when you are out there on the water. This is a board which is highly rated by those who have used it for a long time which shows that this is a board which is going to leave you as a very happy customer. As well as having all the key features that you would want to see to see on a paddle board, it also comes with a great range of accessories which are going to be able to make it highly convenient. 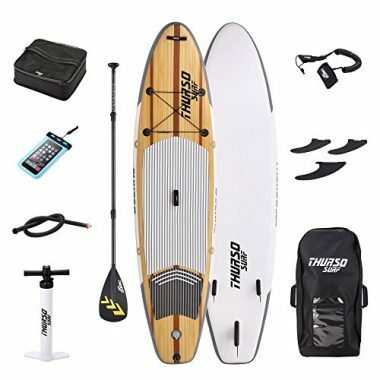 It’s a board that give you everything that you need to easily get to the water and allow you to have great fun while you are out there on it. When it comes to these inflatable paddle boards there are a few important accessories that you expect them to have and this product delivers them with a very high level of quality. They will make it as easy as possible to use, set-up and also make your time out on the water safe and enjoyable. Set up: The first part of setting this board up is the high amount of portability that it has. It’s not too heavy and easily fits into the backpack that it comes with, which means that you can easily transport it to wherever you need to get too. The backpack offers full support to your shoulders without putting any strain on your waist or your back. It will allow you to go on longer walks in order to find the perfect spot for your boarding experience. You also won’t find yourself getting frustrated when trying to put it away as the backpack provides ample room for the board when deflated. Once you find the perfect spot then you’ll find this as easy to set up as all great products should be but you need to know how to inflate your ISUP. You can take the board out of the bag, unfurl it from the strap and roll it out, ready to be pumped up. The valve has a cap which you can take off and then you twist the valve tip in order to open it up. 15 PSI is the recommended pressure for the board and in total the process shouldn’t take any longer than 10 minutes and doesn’t take too much of an effort. Once inflated then you can simply replace the valve cap and you’re ready to go. When completed, you can simply dry off your paddle board, easily deflate it and easily roll it back up. Once the strap is secured then you can easily place it back into the bag. The manual pump that comes with the product works very well but you can also bring your own electric model if you wanted to speed up the process even more. One unique feature that the Waterwalker has is the ability to remove the three fins that they have, so you are able to have your own combination, depending on your preference. As a single fin in still water will be able to give you great tracking abilities, even with its large width. Using the two side fins will allow the board to be faster and with a quicker turn in choppier water which means that you can set your board up to perform in whatever conditions you find. Its 31/32 inch width (depending on the length you get) will be able to give you a stable board but one that still has a good level of maneuverability, this is going to be helped by getting the best SUP paddle possible. This board is also very light too at just 24/26 pounds which makes its maneuverability even higher than most boards which are this wide. The 10’ 6” length of the model is a great all-around board which you stability and quick turns in all conditions and they also have an 11” option which works great in still water. The deck pad is large enough and allows you a great space to be able to stand or kneel and has more than enough cushioning to make a comfortable ride. Overall, this is a great level of performance that you would expect from Thurso Surf and will give even more expert paddle boarders a lot of enjoyment. Price: 90% – While we’d all wish that products could be as cheap as possible, you more often than not get what you pay for and that is definitely the case with this board. It is easy to set up, delivers a high level of performance and it is highly durable. Material: 100% – When it comes up to inflatable stand up paddleboards, they don’t come much more reliable and this model. Its military grade PVC will mean that it is extremely hard to damage the product. The double layer gives you a high level of confidence in its construction. Design: 95% – The wood-effect finish on this board is highly desirable and it will look great out on the water. Its grab handles are conveniently placed and the bungee storage is very easy to use and ensures an enjoyable experience. A kick tail would be a useful addition though, which stops it from getting full marks. Overall: 95% – This is one of the best all-around paddle boards on the market. If you’re an expert boarder then you shouldn’t be expecting the highest level of performance but this is an ideal product for almost all boarders. 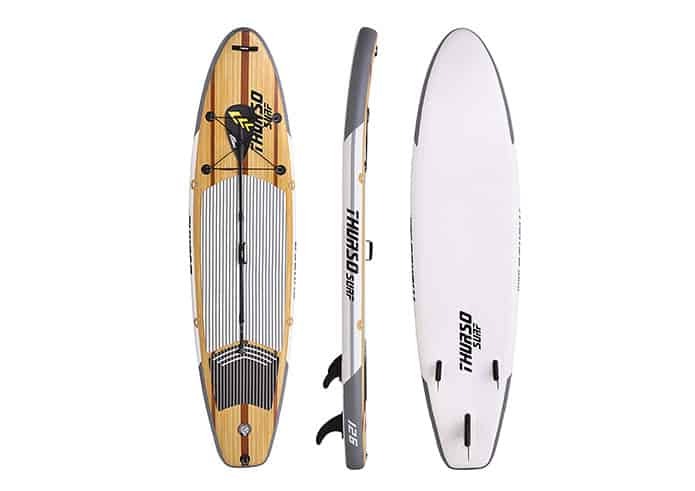 If you’re looking for a paddle board that will work brilliantly in all conditions and for all levels of experience, then the Thurso Surf Waterwalker would be the perfect product for you. It’s wide enough to be able to give a high level of stability but due to its great design and its light weight, it’s also has a high level of maneuverability too. At 15 PSI it is very rigid and will feel like a regular paddle board and can hold up to 380 pounds in weight to accommodate almost everyone. It’s not too light that it will be affected much by the wind though but it is still easy to carry in the large and comfortable backpack that it comes with. Despite being founded in 2016, Thurso Surf have quickly developed a reputation as a company who develop quality products and you can see why with boards such as this.